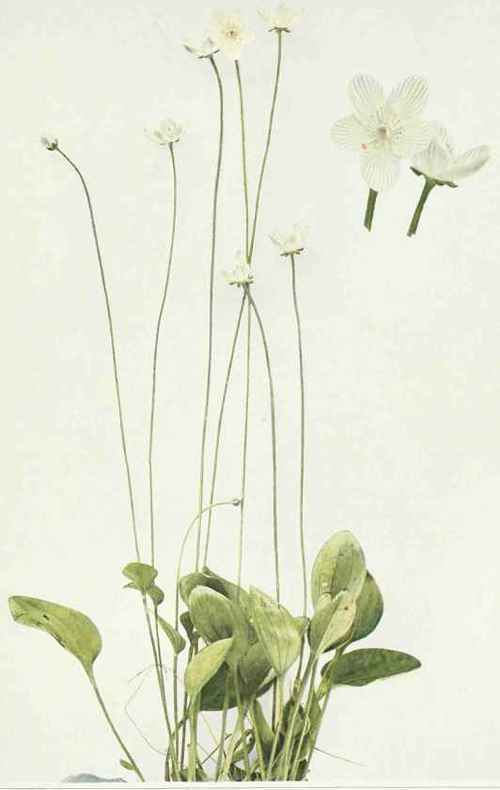 Flowering scape 6 to 20 inches high, with a sessile, ovate, clasping leaf below the middle. Basal leaves very numerous, ovate, oval, or nearly orbicular, obtuse at the apex, rounded or slightly cordate at the base, or decurrent on the petiole, 1 to 2 inches long, on petioles 2 to 6 inches long. Flowers three-fourths to 1½ inches broad; calyx lobes five, ovate-oblong, obtuse and much shorter than the five broadly oval, white, greenish veined petals; each petal with a set (usually three) of gland-tipped staminodia at the base which do not exceed the five fertile stamens in length, the latter alternate with the petals. Fruit a one-celled capsule about one-half of an inch long. In swamps, low meadows and boggy places, New Brunswick to Manitoba, south to Virginia, Illinois and Iowa. Flowering from July to September, rarely earlier than July in our latitude. At Taberg growing on wet cliffs with the Yellow Mountain Saxifrage and Dwarf Canadian Primrose.